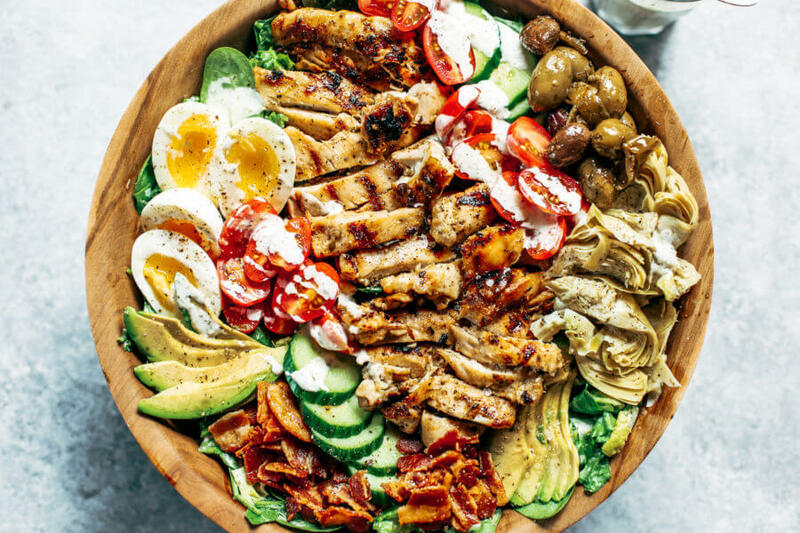 Fresh and easy Caesar Cobb salad. 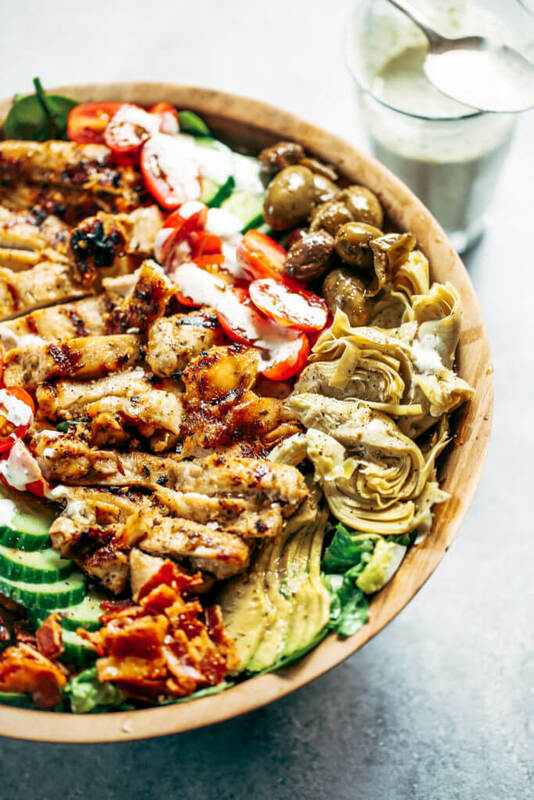 Made with grilled chicken, avocado, bacon, all the toppings, and creamy Caesar dressing! 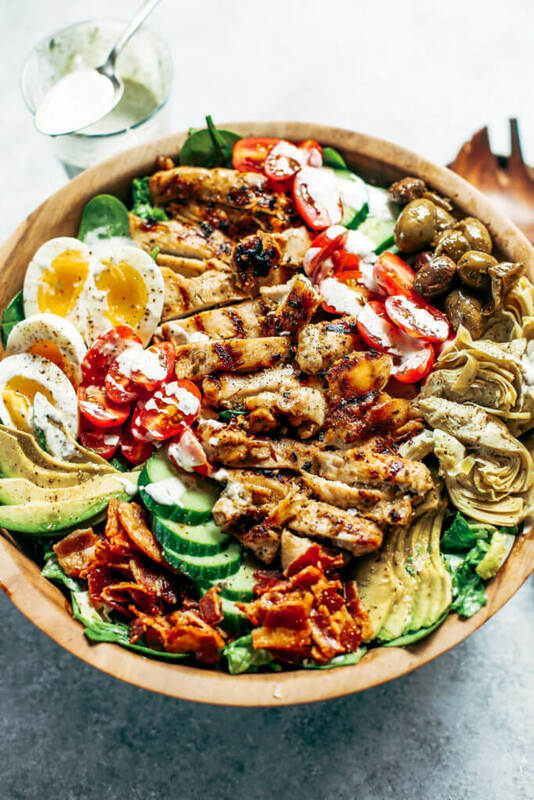 A fast whole30 and paleo family dinner recipe for meal prep. Are you ready for the salads of all salads? 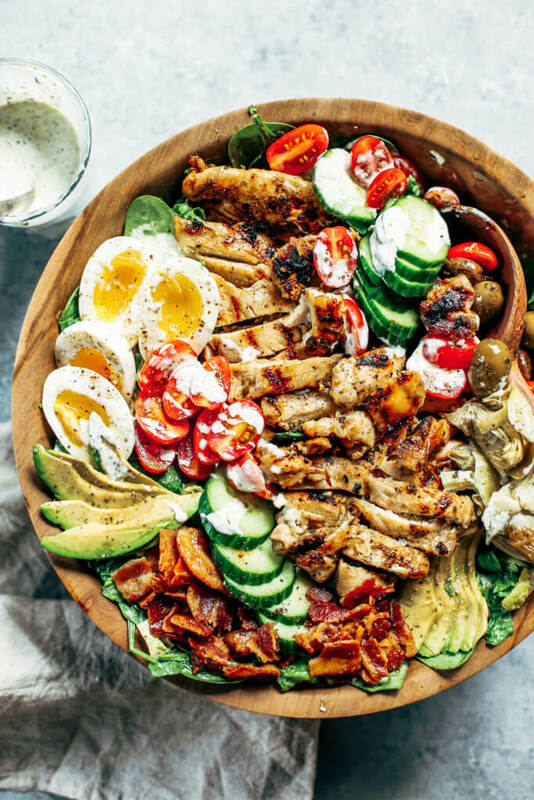 The fresh and tasty Caesar-Cobb combo that will leave you drooling? I mean, there’s everything in there. 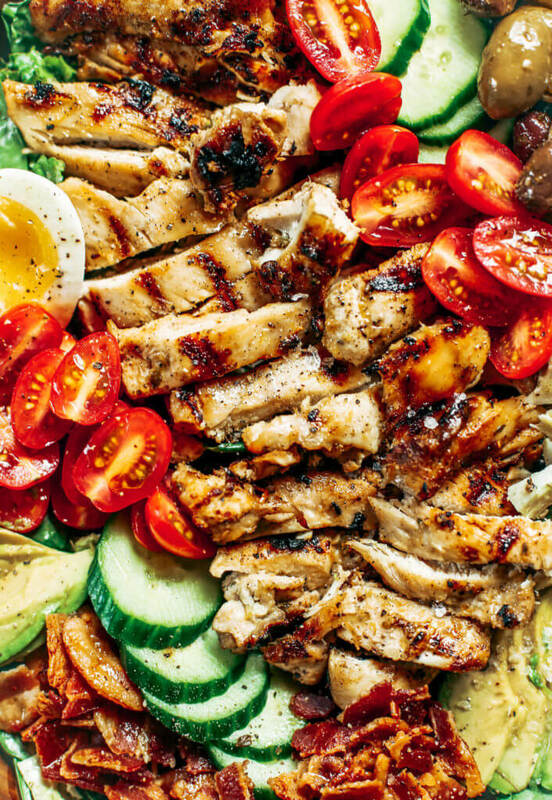 Check out those crispy bacon bites, jammy eggs, grilled lemon herb chicken, and homemade dressing! Grab your fork and let’s get cooking! Every 4th of July, my family and I go to the grandparents. We eat hamburgers with extra mustard, juicy watermelon, and loads of potato salad in the sunshine and watch the planes fly overhead. It’s a family affair with lots of yard games, hugs, and sparkling waters. Grandpa mans the grill and pops out juicy burgers dripping with melted cheddar. Aliya and Grandma make the favorite potato salad by the boatload. Mama and Joe cut up a Trader Joe’s watermelon the size of your head and mine combined. And I pretty much do whatever else needs to be done, see: dishes. We feast on burgers and allll the summer foods, then finish everything off with Grandma’s famous orange jello salad. After stuffing ourselves and waving sparklers in the lawn after dark, we pile on the grass overlooking the bay and watch fireworks explode across the ocean. It’s a magical time that leaves you feeling all mushy inside. Grandpas not here anymore, we aren’t having burgers, and we are keeping things pretty green around here, since I’m the one cooking while the guys do yard work. 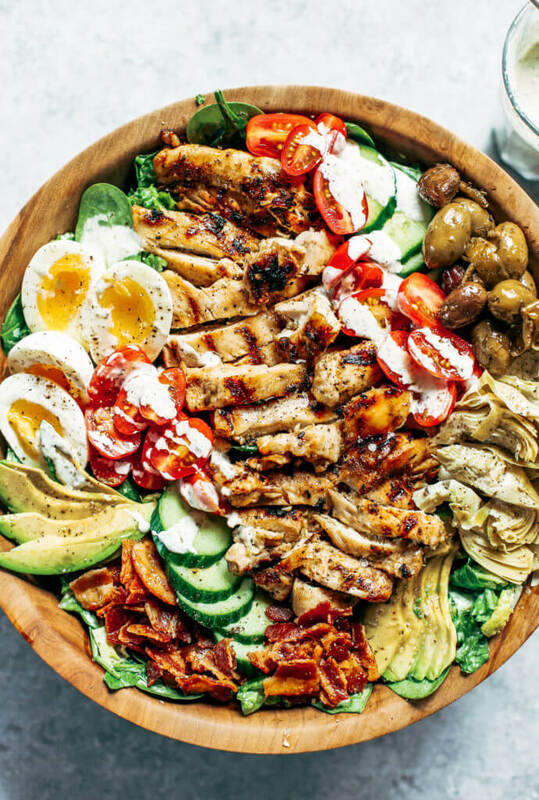 It’s caesar cobb salad all the way. We all miss Grandpa and we are not at Grandma’s this year. Things have changed since we were little, but we are still going to watch fireworks tonight- just not by the ocean. Instead, we will be sharing an oversized bucket of cinnamon sugar popcorn from the hood of our car next to a thousand other people. It will still be a good time that leaves you feeling all mushy inside. So, cheers to lunch with piles of veggies, fireworks, and fam! How to make soft boiled eggs: bring a saucepan with water to a boil. Add eggs and cook for 7 minutes (9-10 minutes for hard boiled), then transfer to an ice bath and cool before peeling. Rub chicken thighs with seasonings and olive oil. Grill over medium heat on a cast iron grill pan lightly greased with olive oil. Grill about 10 minutes on each side until cooked (there should be no pink in the chicken when you cut it in the middle). Then set aside and let it rest before cutting into strips. Blend ingredients for dressing in a food processor or blender until smooth. 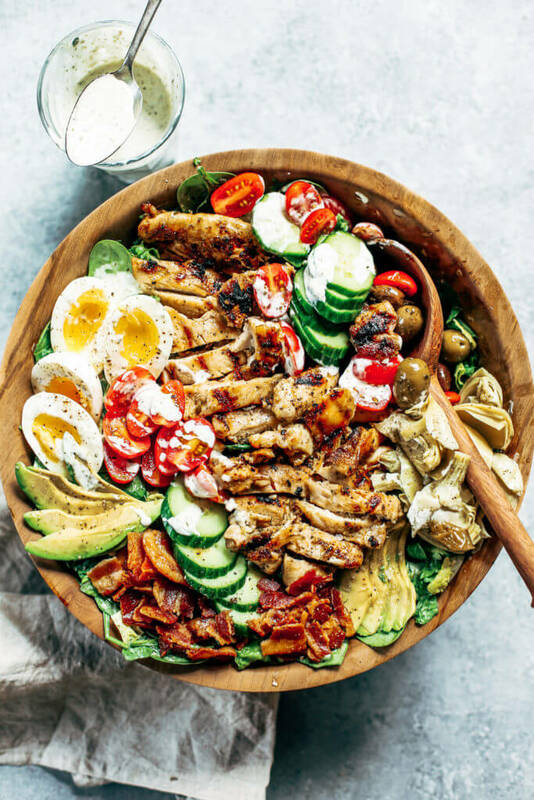 Prepare vegetables and toppings, then layer everything into a large bowl, toss with dressing, and serve!